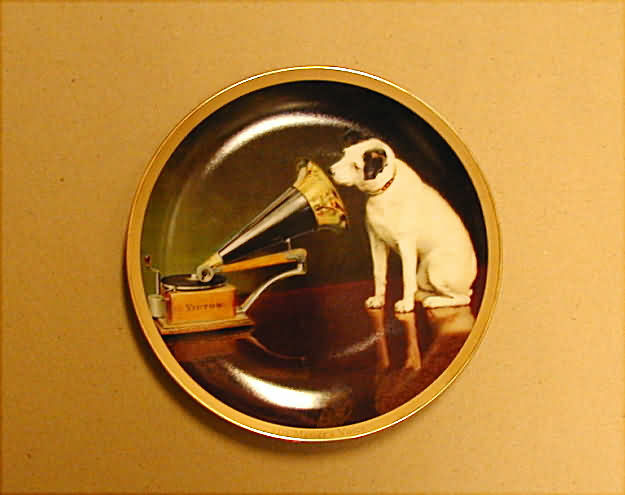 NIPPER PLATE: Nipper plate - His That Our Mistress's Voice?, it is 10 3/4 inches diameter. 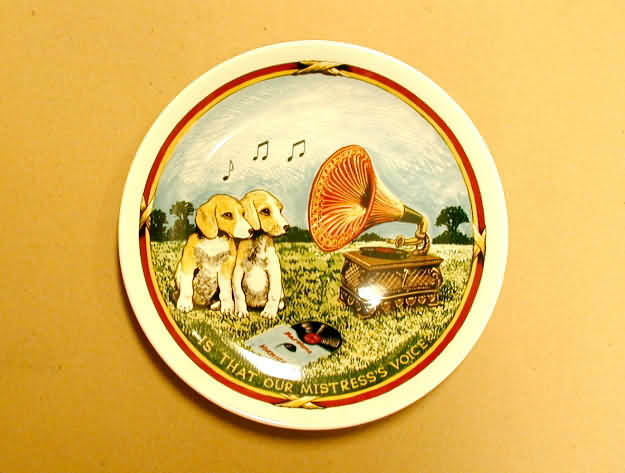 NIPPER PLATE NOVELTIES: A Nipper Plate by Lynell Co. 1980, 8 5/8 inches diameter. 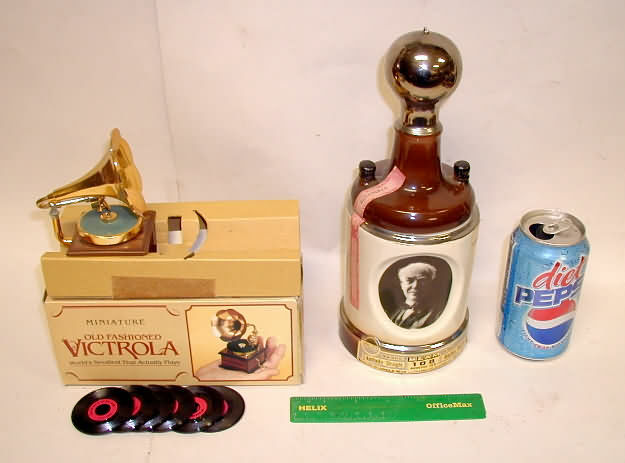 PHONOGRAPH NOVELTIES: Miniature phonograph toy with 6 records - sold); a 1979 Regal China Beam bottle shaped like a light bulb (11 inches tall). 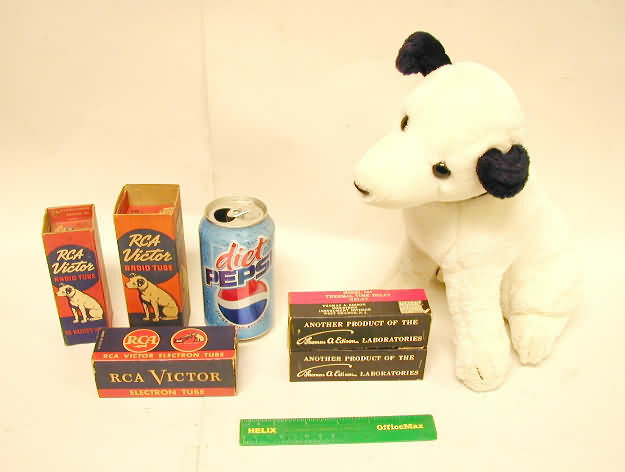 PHONOGRAPH NOVELTIES: RCA Nipper radio tube boxes, center is a Edison Delay Relay, right is a 10 3/4 inch plush Nipper (sold). 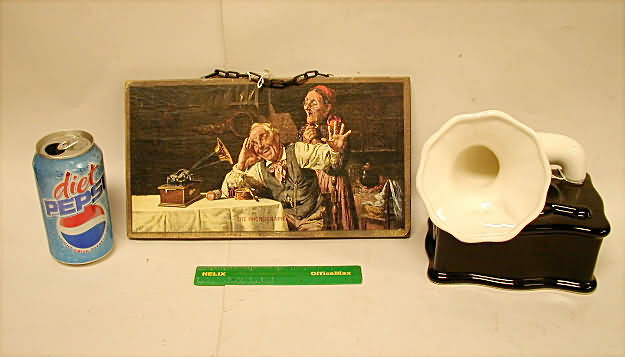 PHONOGRAPH NOVELTIES: Wood wall hanging sign for Edison cylinder player (11 3/8 x 6 1/4) and right is a black/white ceramic phonograph. 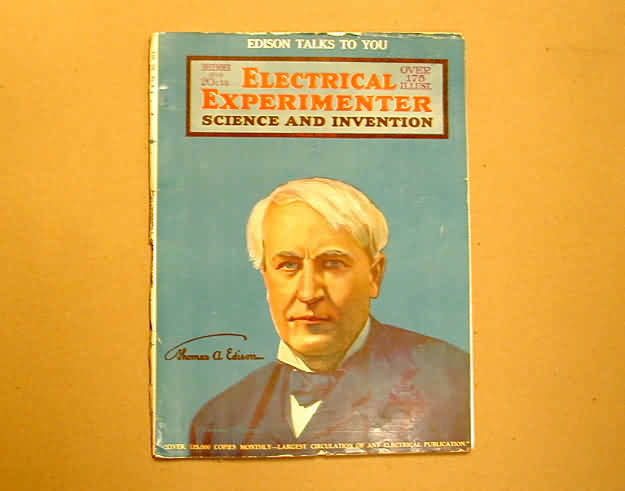 EDISON: A December 1919 issue of Electrical Experimenter magazine with Thomas Edison on cover. Magazine is FR+ to GD-. 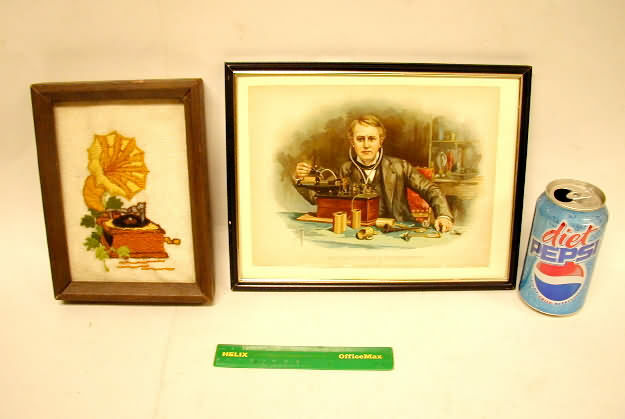 PHONOGRAPH NOVELTIES: A framed needle point (6 x 8 1/8) and a framed stone lithogragh picture from an early book of Thomas Edison, scarce and beautiful. 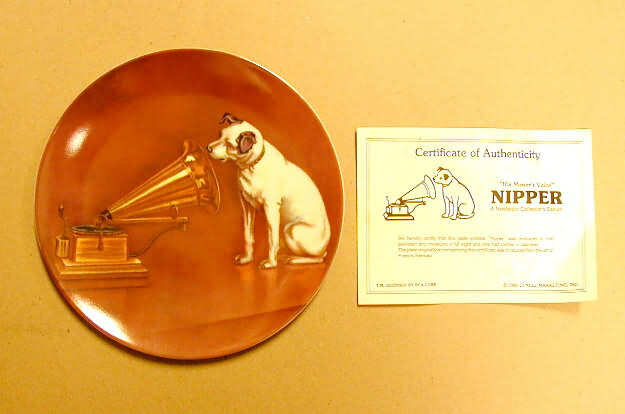 NIPPER SIGNS: Left is a porcelain over metal (repro), 11 1/4 inch diameter, right is same (10w x 8H). 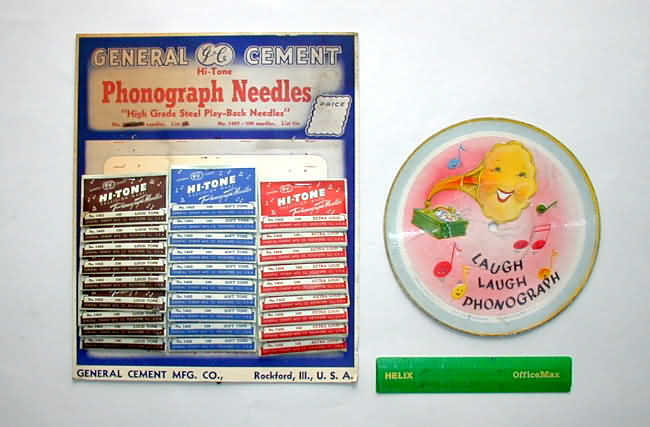 PHONOGRAPH NEEDLES and RECORD: Old original steel pointed needles (like new) from 1940's. 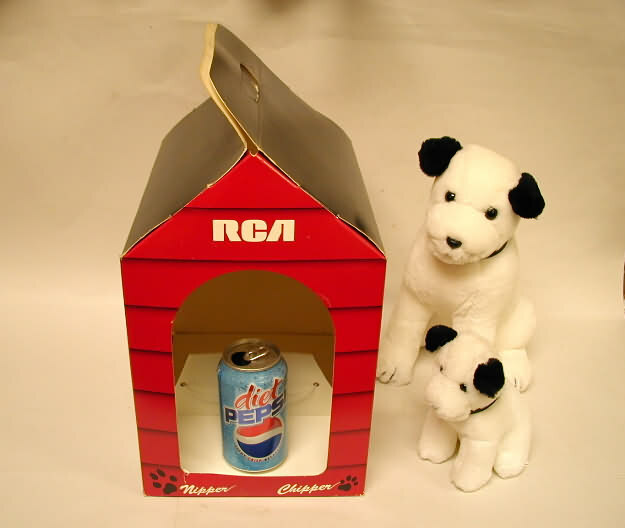 Sold by the pack of 100 only - either soft, loud, or extra loud - $4.00 each. 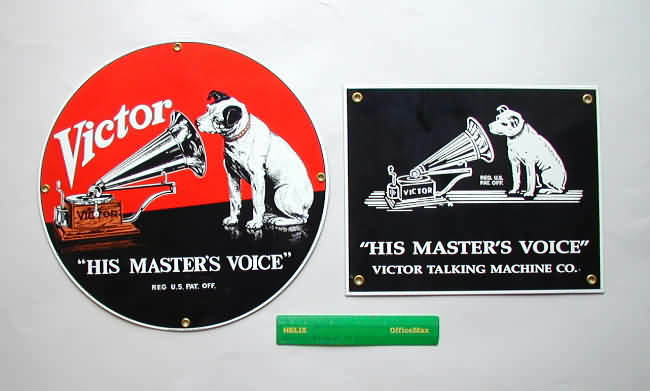 Right is a childs record by Voco Co. 1948 - sold. 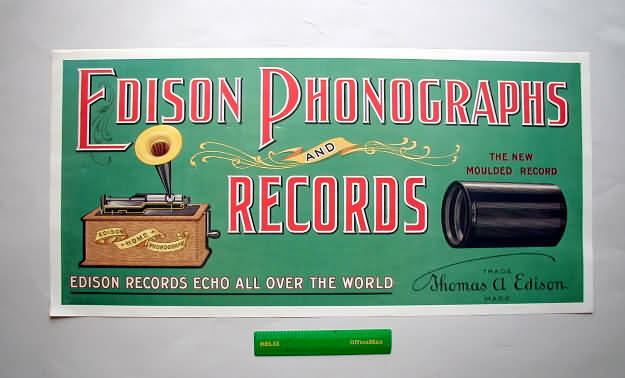 EDISON SIGN: A beautiful reproduction paper sign 25 inches wide and 12 1/2 high. No expenses were spared in producing this color ad. 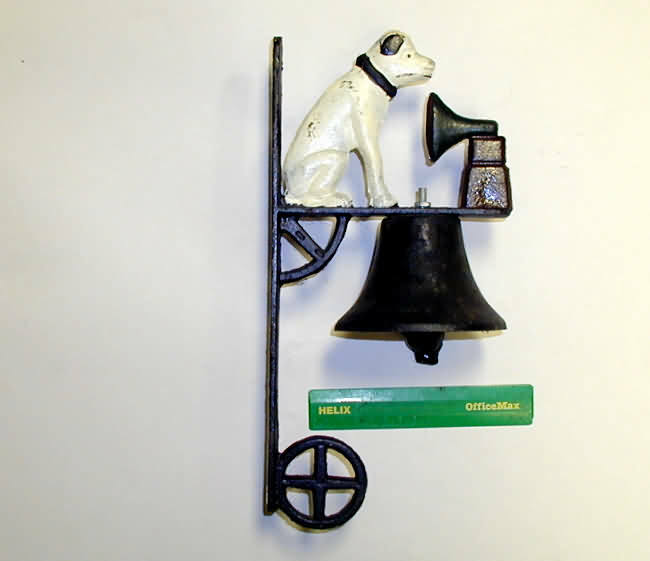 Made from the original sign here in Cleveland, Ohio. 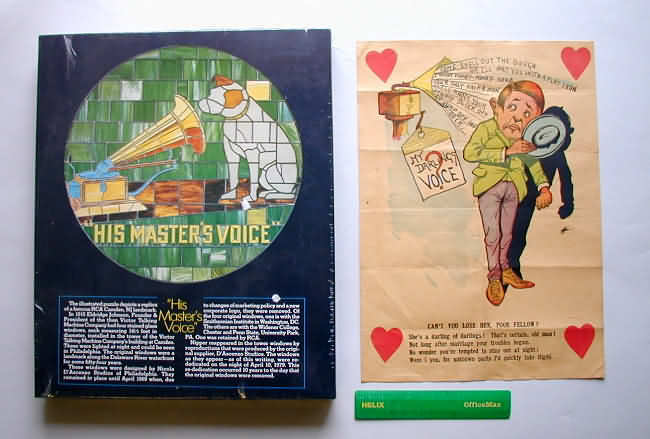 PHONOGRAPH NOVELTIES: Left is a puzzel of the RCA Camden, NJ Nipper (sealed box, size? 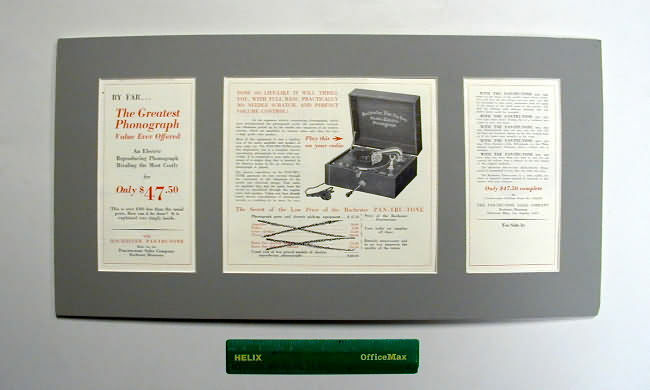 ), right is a single sheet phongraph cartoon. LIGHT BULB BOOK ENDS: Nicely made book ends of mahonany wood. 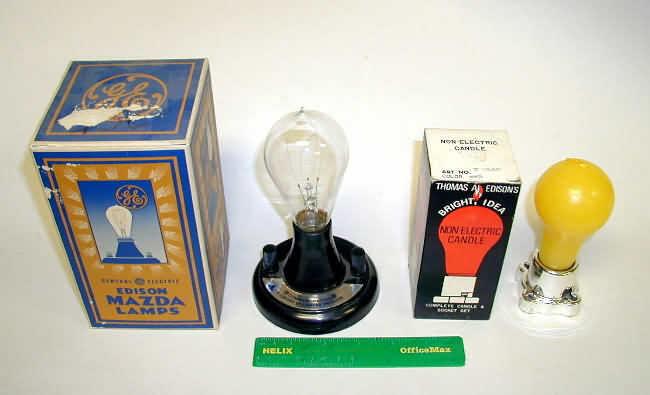 Each side has a bulb under a platic dome. Size of each is 5 1/4W, 6 3/8Hh, 5 1/8 deep. 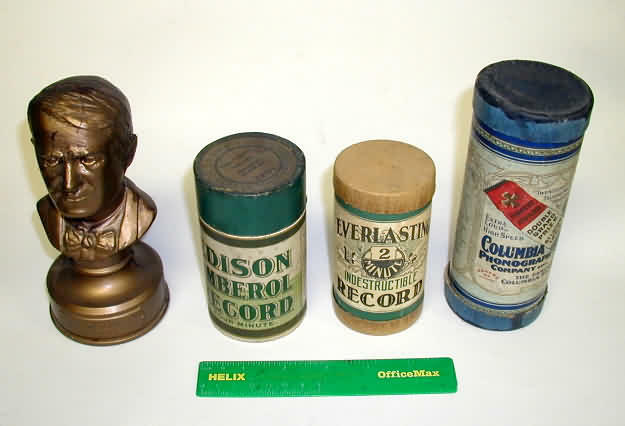 PHONOGRAPH NOVELTIES: Left is a card game (Quiz Wiz) showing Edison on box top, center is a needle holder with felt duster on bottom, right is 1/2 of a Salt and Pepper set (3 1/2 inches high). 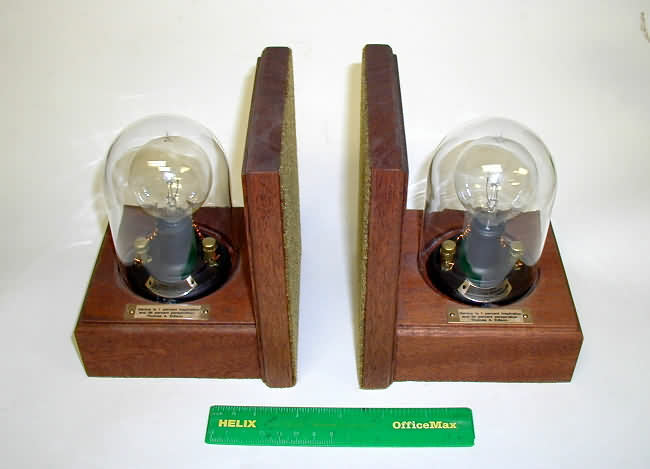 1979 LIGHT BULBS: left is a working bulb with wood base and AC cord with original box (sold), right is similair but bulb is burned out, good for a display piece. 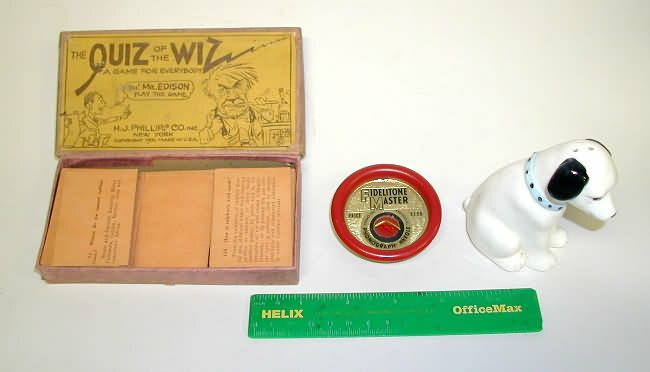 1979 LIGHT BULB, CANDLE: Left is a G.E. 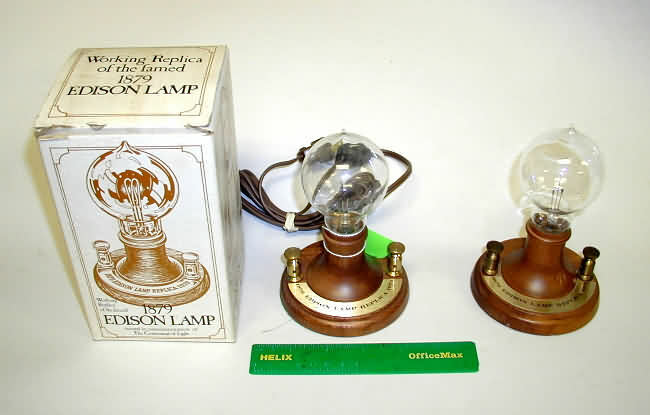 1979 anniversary light bulb with plastic base and original box (box not perfect); right is a wax candle light bulb - sold.